A protest campaign was staged in front of the American Embassy in Colombo condemning the interfering of the internal affairs of Venezuela by USA and its allies and demanding to stop all threats and sanctions against Venezuela. 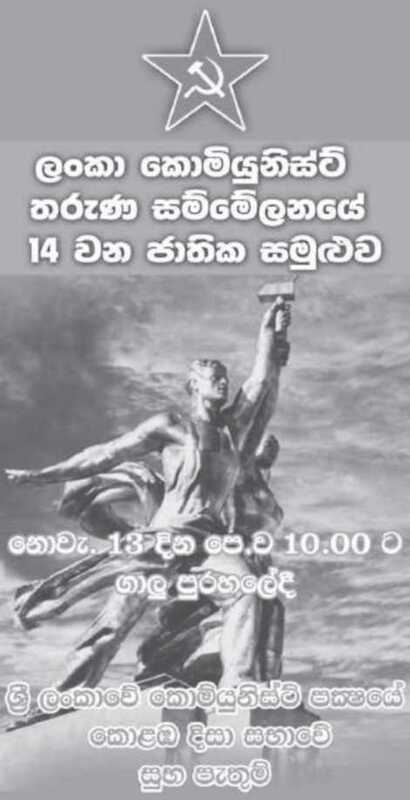 Management Assistant Services Trade Unions Alliance Trade Union ActionManagement Assistant Services Trade Unions Alliance staged huge demonstration in Colombo demanding Government to solve long standing 13 demands related to their service. 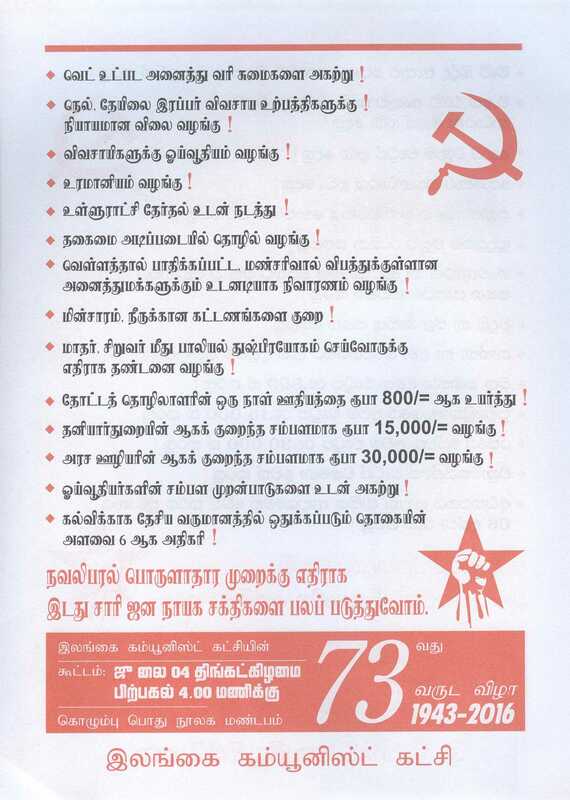 Comrade K.P. 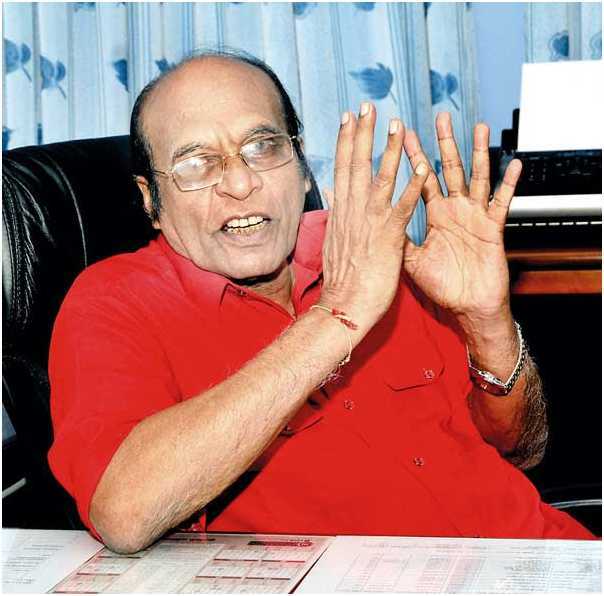 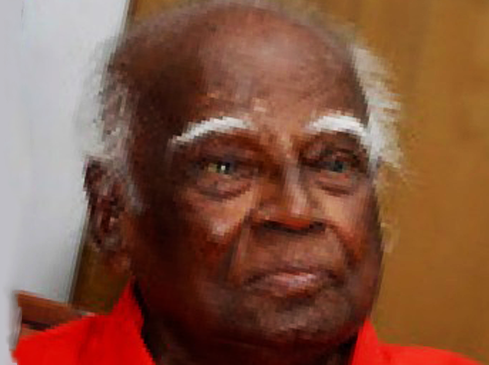 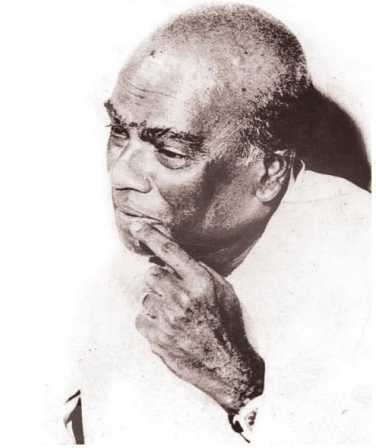 Silva, Former General Secretary of the Communist Party of Sri Lanka, Member of Parliament (1994 - 2000) passed away on 8 th March 2019 at the age of 96. 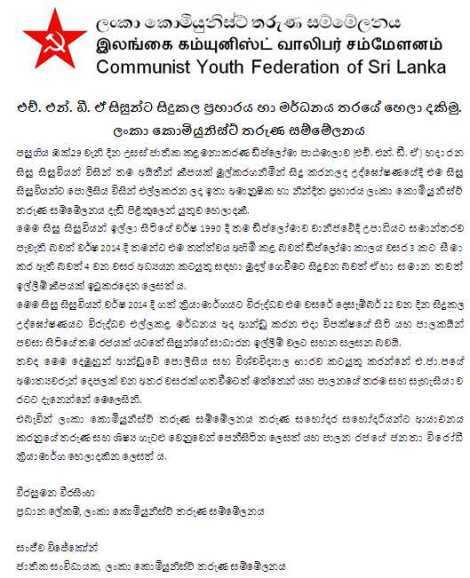 Funeral took place on 11 th March 2019 with large gathering including all leaders of Political Parties, Trade Unions and Youth Organizations. 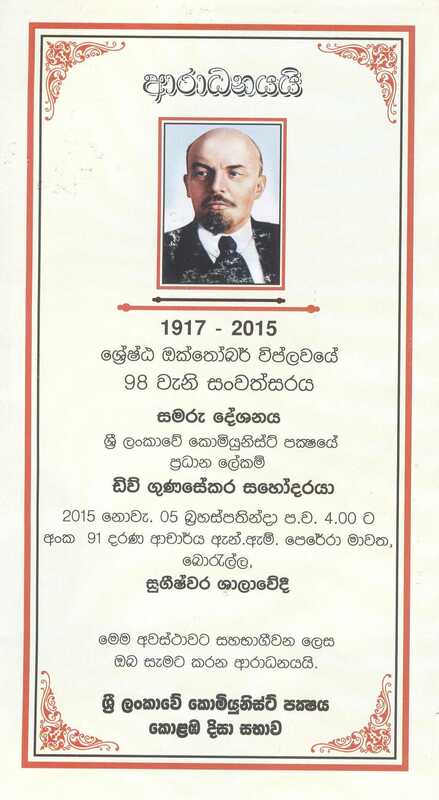 ලංකාවේ වමේ ව්‍යාපාරයේ පුරෝගාමියකු වන කේ.පී. 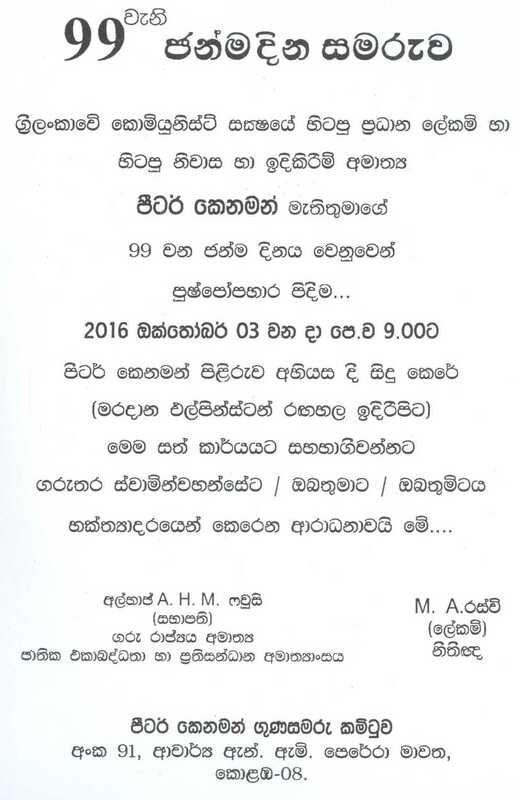 සිල්වා මහතා මිය යන විට 96 වැනි වියෙහි පසුවිය. 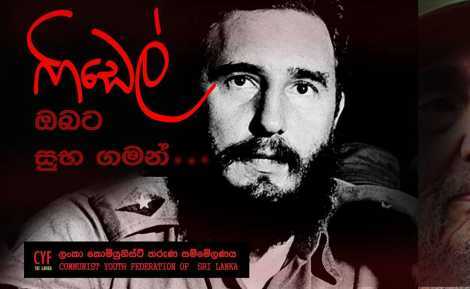 ඔහුගේ අවසන් කටයුතු අද (11දා) සවස බොරැල්ල කනත්තේදී සිදු කෙරේ. 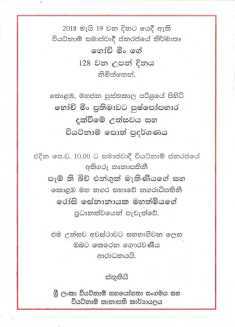 ඒ මහතාගේ දේහය, අද පෙරවරුවේ සිට මහජන ගෞරවය සඳහා ශ්‍රී ලංකා කොමියුනිස්ට් පක්ෂ මූලස්ථානයේ තැන්පත් කර ඇත. Former Member of Parliament and the General Secretary of the Sri Lanka Communist Party, K.P. 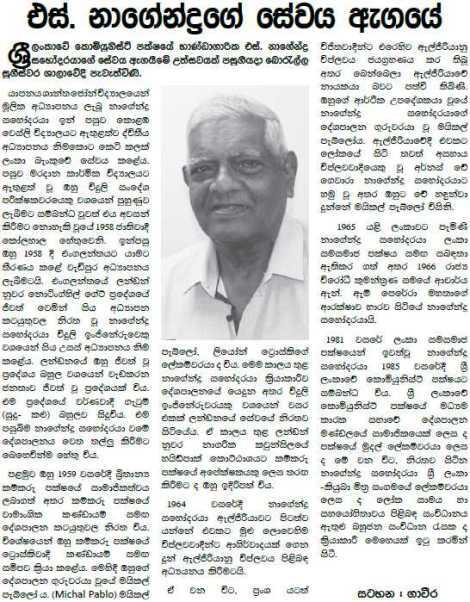 Silva has passed away. 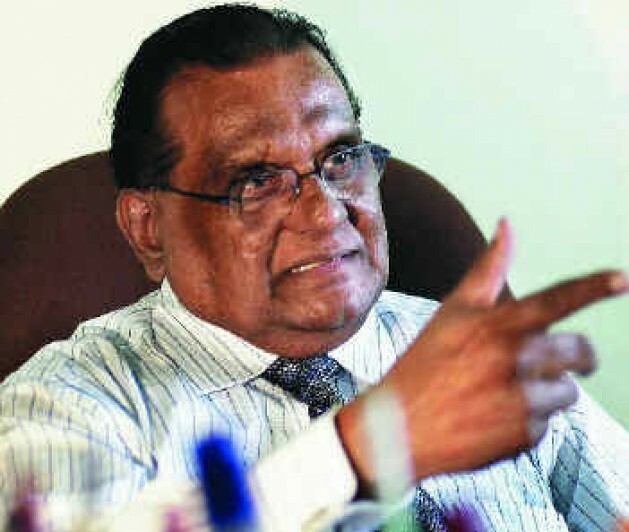 The remains are lying at the Jayaratne Parlour in Borella and the funeral will take place on Monday, March 11 at the Borella General Cemetery. 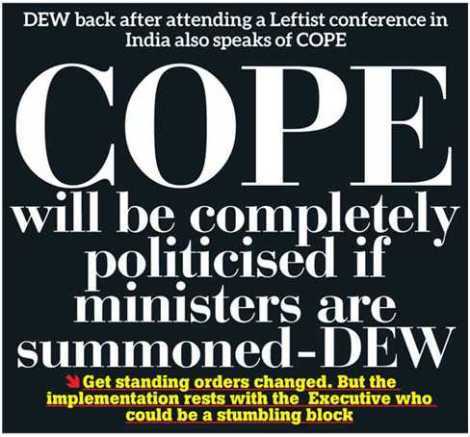 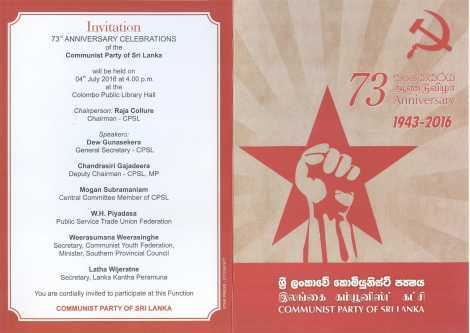 Remains will lie at the Communist Party head office in Colombo from 11.00 am on Monday. 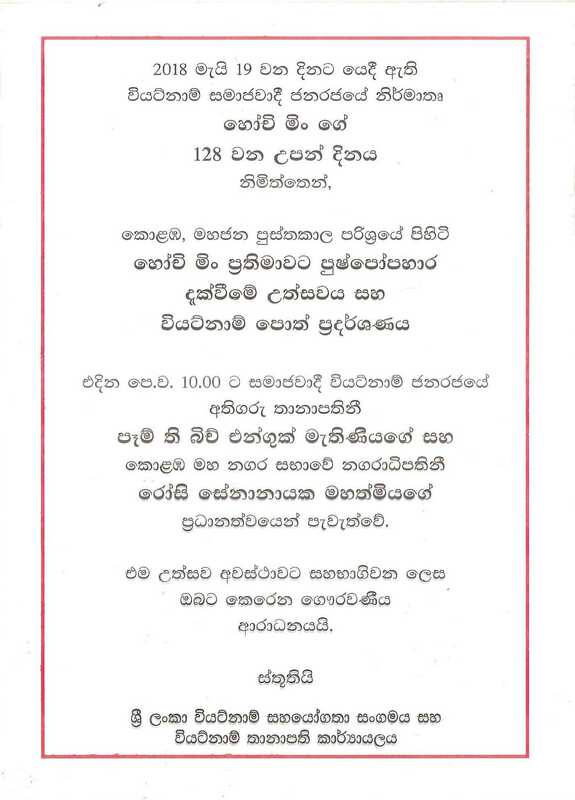 තරුවක අරුණ ග්‍රන්ථය පළමු වෙළුම 2018.08. 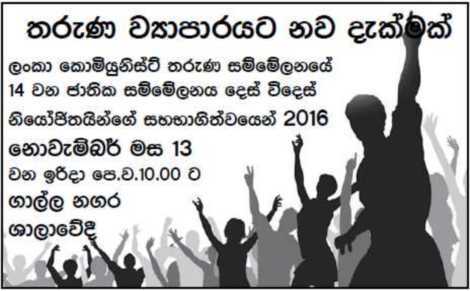 28 දිනයේ කොළඹ මහවැලි කේන්ද්‍රයේදී එලි දැක්වීම. මෙරට ප්‍රකට වාමාංශික ක්‍රියාකාරිකයකු වන අගා ජයසේන මහතා විසින් රචිත 'තරුවක අරුණ' (කම්කරු සටනින් බිහි වූ කොමියුනිස්ට් පක්‍ෂය) කෘතිය පෙරේදා (28දා) කොළඹ මහවැලි කේන්ද්‍රයේදී එළිදැක්විණි. 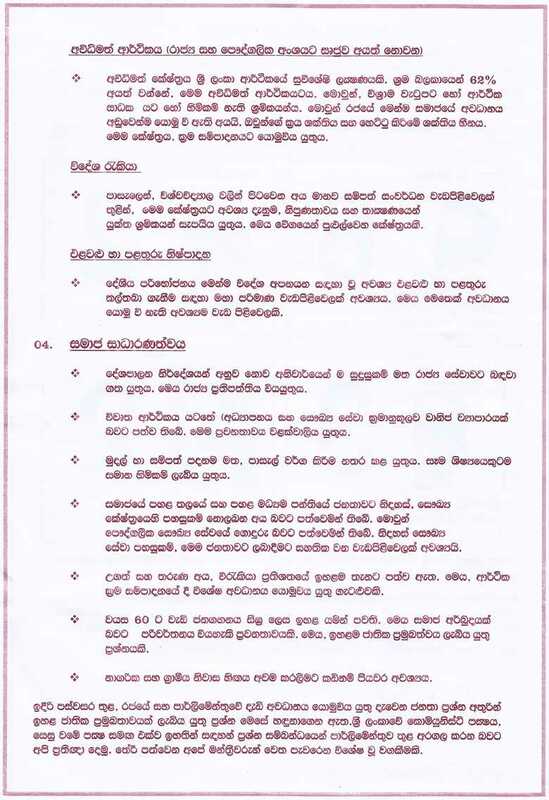 ශ්‍රී ලංකාවේ කොමියුනිස්ට් පක්‍ෂයේ 75 වැනි සංවත්සරය වෙනුවෙන් මෙම කෘතිය එළිදැක්වුණු අතර මෙම කෘතියේ මුල් පිටපත කම්කරු නායක කේ.ඊ. 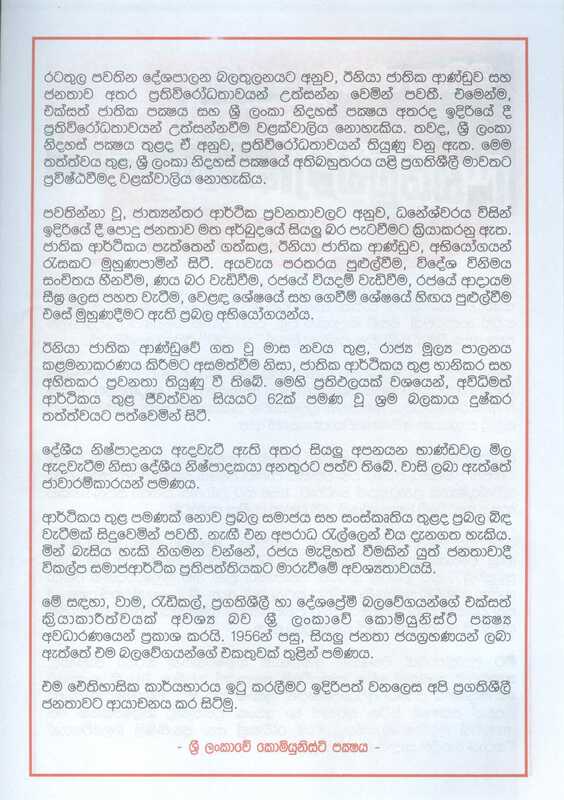 බ්‍රිටෝ මහතා වෙත අගා ජයසේන මහතා විසින් පිළිගන්වනු ලැබිණි. 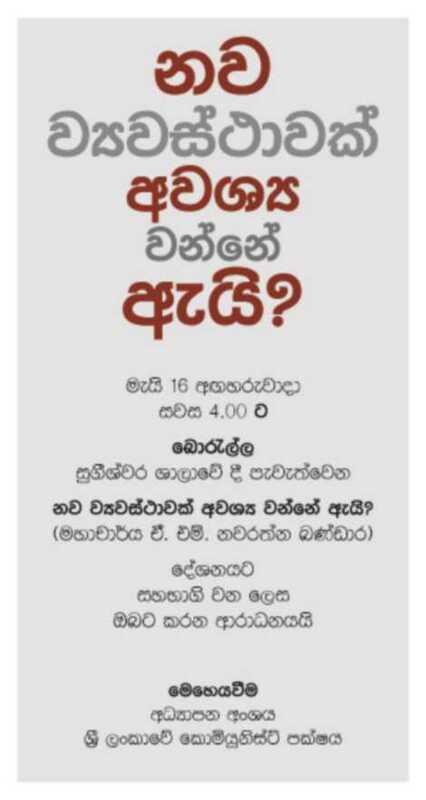 මේ අවස්ථාවට දේශපාලන නායකයන් වන දිනේෂ් ගුණවර්ධන, වාසුදේව නානායක්කාර, ඩිව් ගුණසේකර, එස්.බී. 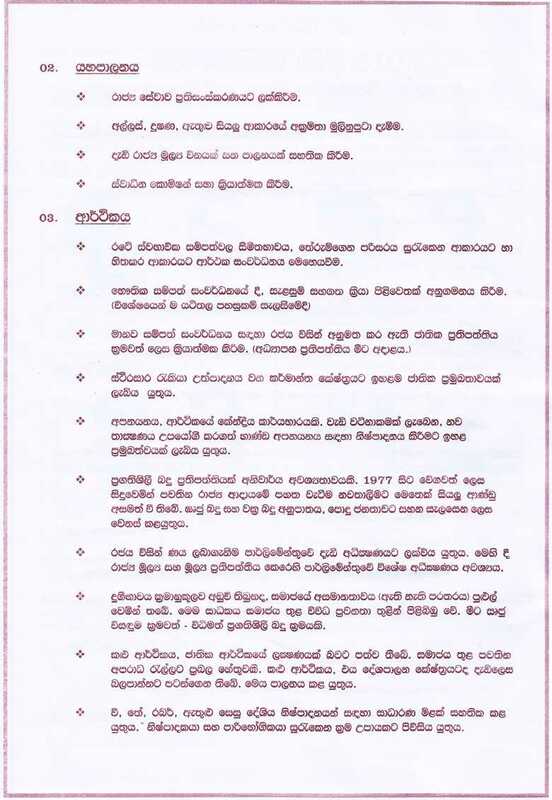 දිසානායක, විදුර වික්‍රමනායක, රෙජිනෝල්ඩ් කුරේ, කේ.ඩී. 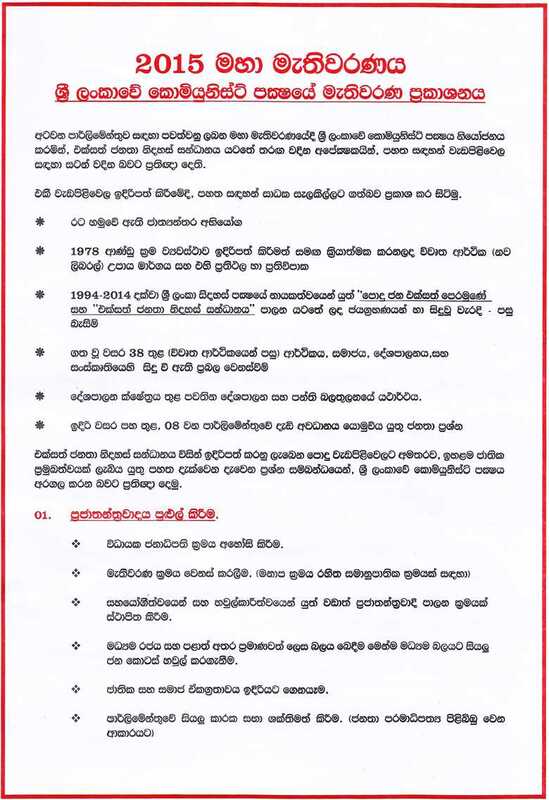 ලාල්කාන්ත, නලින්ද ජයතිස්ස, බිමල් රත්නායක, රෝහණ ලක්‍ෂ්මන් පියදාස, චන්ද්‍රසිරි ගජධීර ඇතුළු පිරිසක් එක්ව සිටියහ. 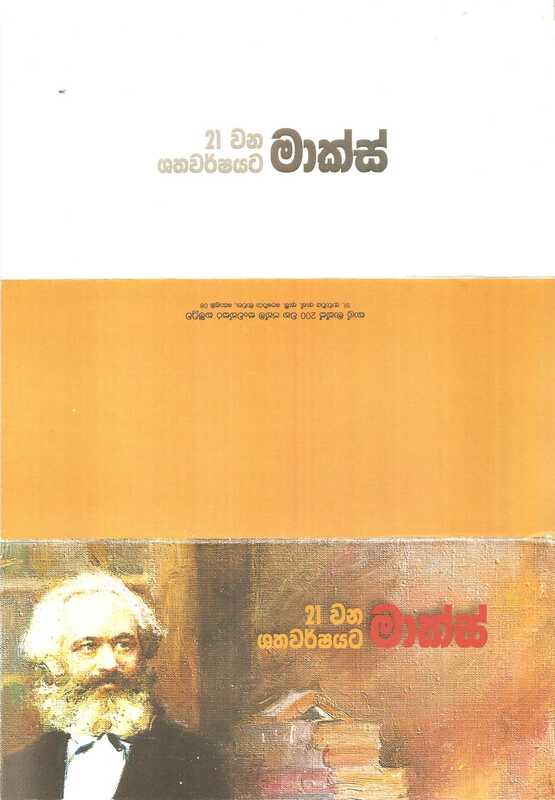 ශ්‍රී ලංකාවේ කොමියුනිස්ට් පක්‍ෂයේ ඉතිහාසය 'තරුවක අරුණ' කෘතියට ඇතුළත් වේ. 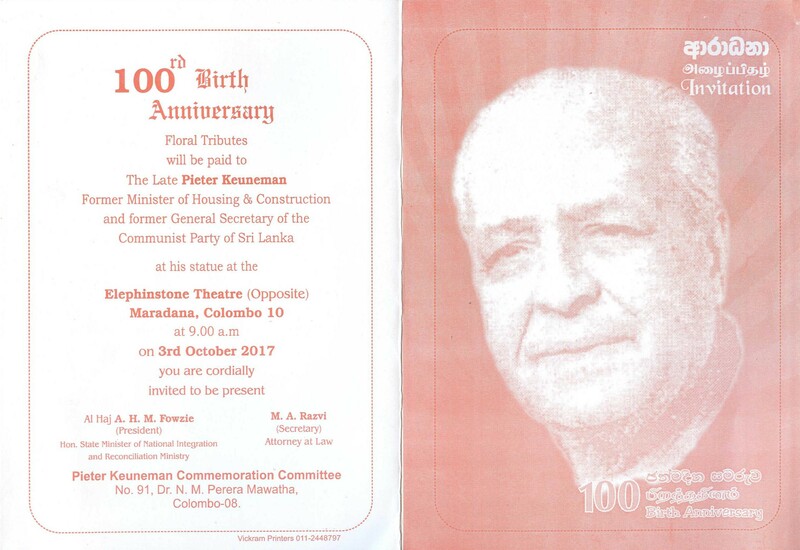 Hundred years anniversary to the Great October Revolution by the Communist Party of Sri Lanka on 07th November 2017 at Nelum Pokuna theater. 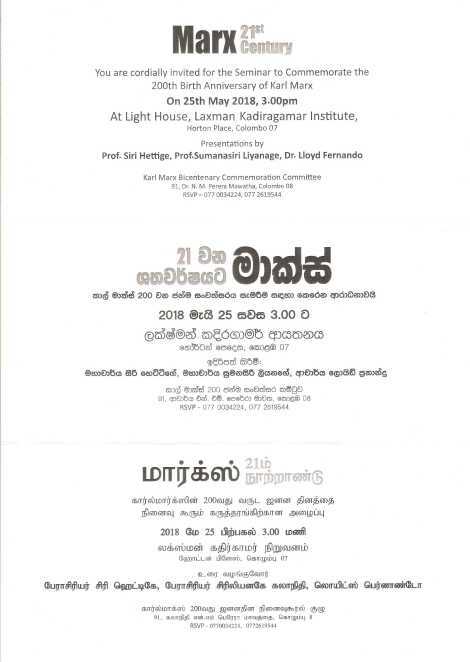 ශ්‍රී ලංකාවේ කොමියුනිස්ට් පක්ෂයේ 21 වන ජාතික සම්මේලනය 2017. 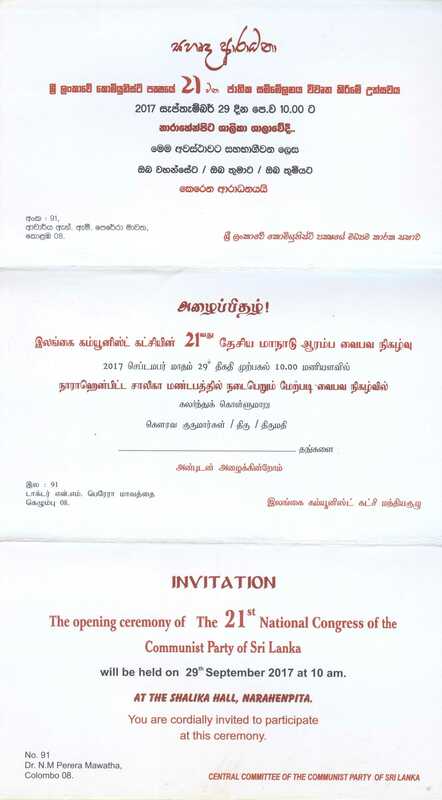 21st National Congress of the Communist Party of Sri Lanka 2017. 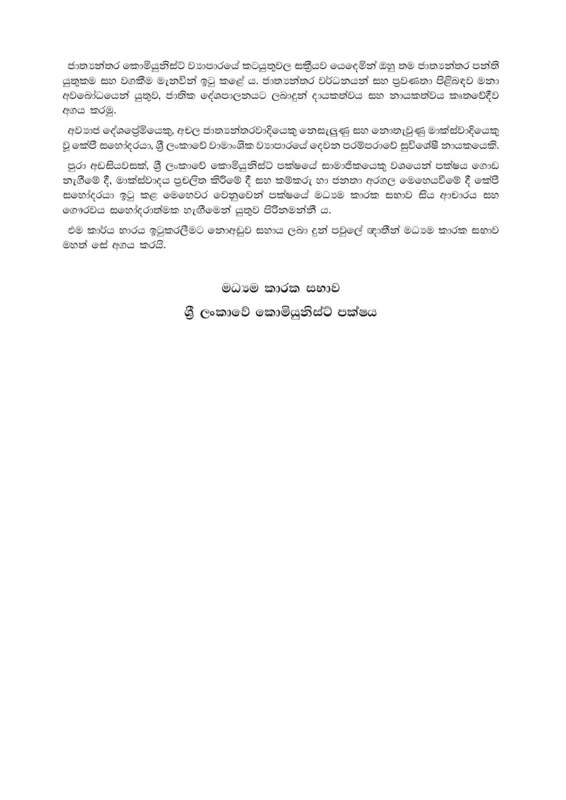 72වන වියට්නාම් ජාතික දින උත්සවය වෙනුවෙන් ශ්‍රී ලංකාවේ පැවති උත්සවය. 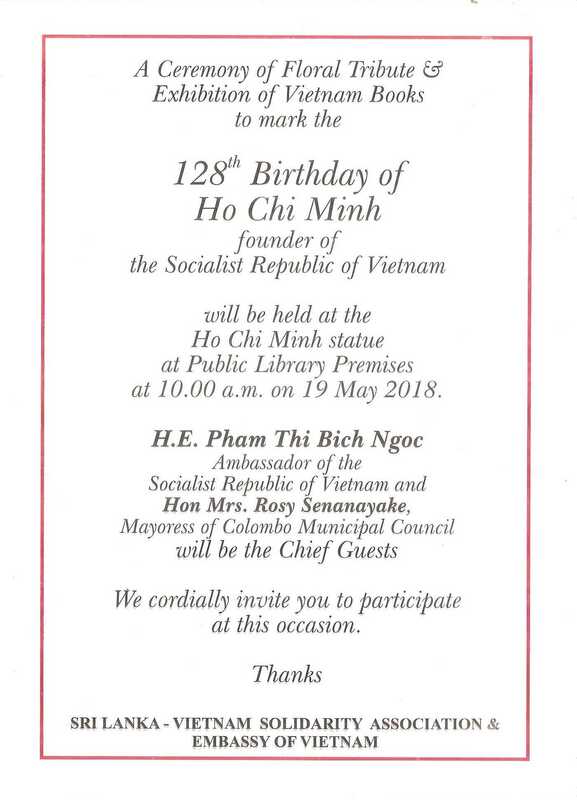 Ceremony of the 72nd Vietnamese National Day. ශ්‍රී ලංකාවේ කොමියුනිස්ට් පක්ෂයේ 74 වන සංවත්සරය නිමිත්තෙන්, පක්ෂයේ කොළඹ දිසා සභාවේ මෙහෙයවීමෙන්, වැල්ලවත්ත ශ්‍රී සුගත විහාරාධිපති පූජ්‍ය ඌරුමුත්තේ සුගතානන්ද නාහිමිපාණන්ගේ අනුශාසකත්වය යටතේ ශ්‍රී සුගත විහාරස්ථානයේ නේවාසිකව සිටින දෙමාපියන් අහිමි ළමයින් පිරිසකගේ අධ්‍යාපන කටයුතු වෙනුවෙන් අභ්‍යාසපොත් බෙදා දීමේ උත්සවය පක්ෂයේ සභාපති රාජා කොල්ලුරේ සහෝදරයාගේ ප්‍රධානත්වයෙන්, ජාතික සංවිධායක එල්. 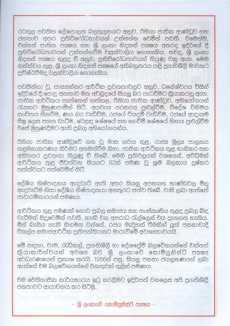 ආර්. ස්ටීවන් හා මධ්‍යම කාරක සභික විල්ෆ්‍රඩ් ජයසිංහ යන සහෝදරවරුන්ගේ සහභාගීත්වයෙන් 2017/ 07/ 02 වන දින ප. 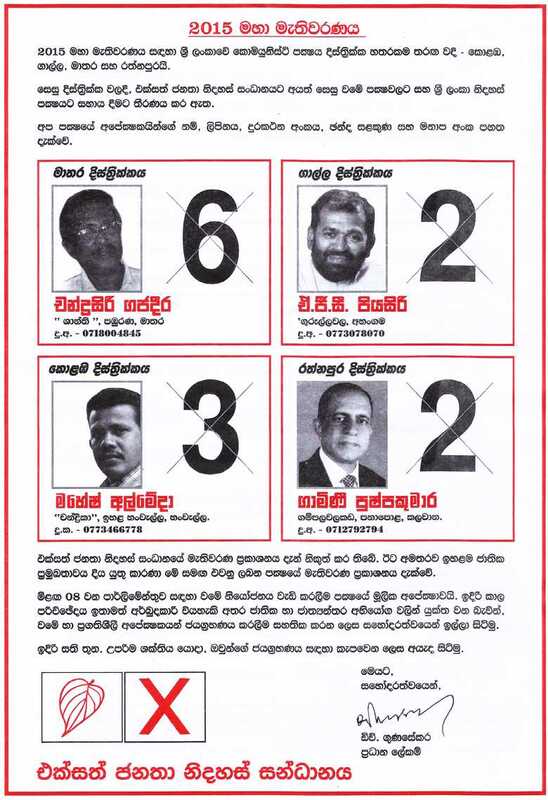 ව. 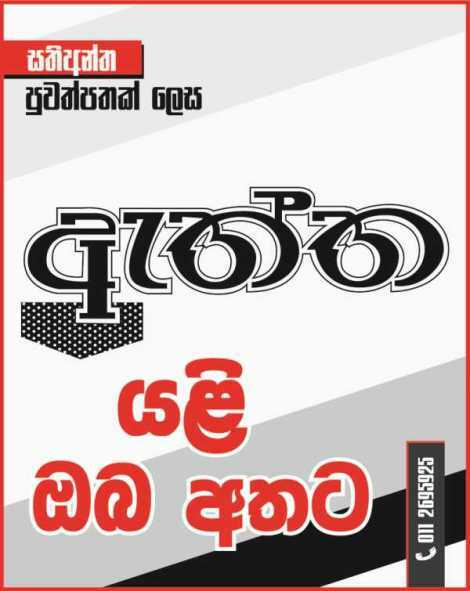 3.30ට ඉහත කී විහාරස්ථානයේදී පවත්වනු ලැබීය. 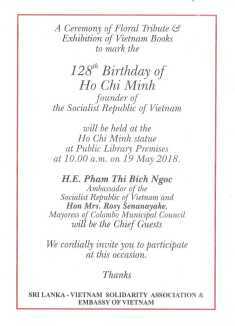 A Ceremony of Floral Tribute To Mark the 127th Birthday of Ho Chi Minh (Founder of the Socialist Republic of Vietnam) was held at the Ho Chi Minh Statue at Public Library Premises on 19th May 2017. 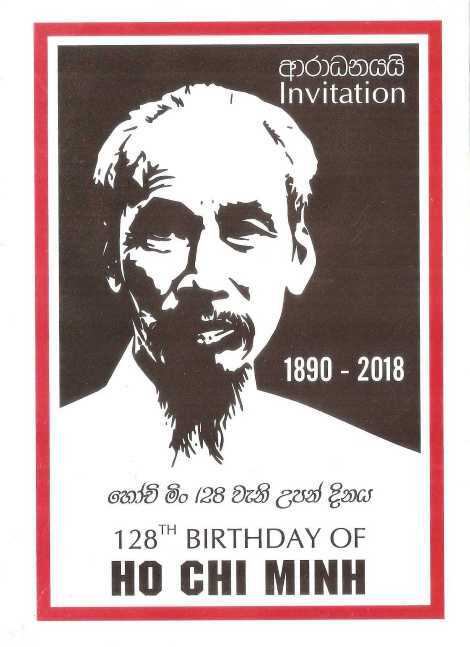 Comrade D.E.W Gunasekara, Professor Thissa Vitharana, H.E Phan Kieu Thu (Ambassador of the Socialist Republic of Vietnam), Commissioner of South Africa, Hon. Minister AHM Fowzie, Comrade S. Sudasinghe (General Secretary of Sri Lanka - Vietnam Solidarity Association), Comrade L. R Stephan (Deputy Secretary of Sri Lanka - Vietnam Solidarity Association) were present in this occation. 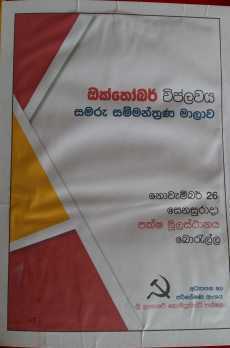 A lecture on "Why need a new constitution?" 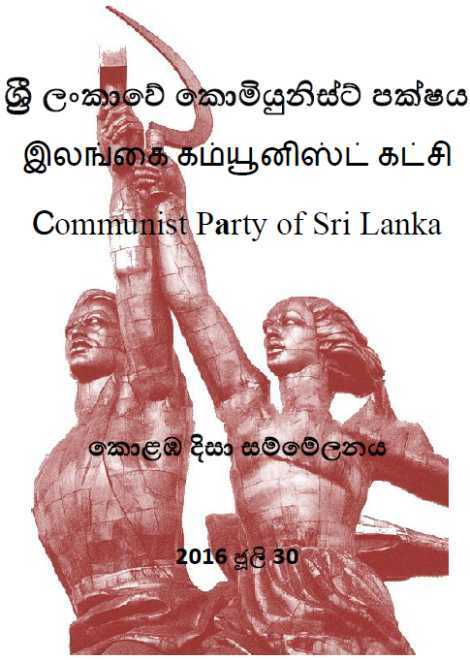 by Professor Nawarathna Bandara on 16th May 2017 at the Sugiswara Hall, Headquarters, Communist Party of Sri Lanka. 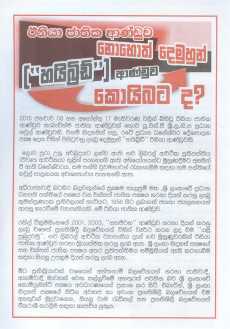 නව ව්‍යවස්ථාවක් අවශ්‍යවන්නේ ඇයි? 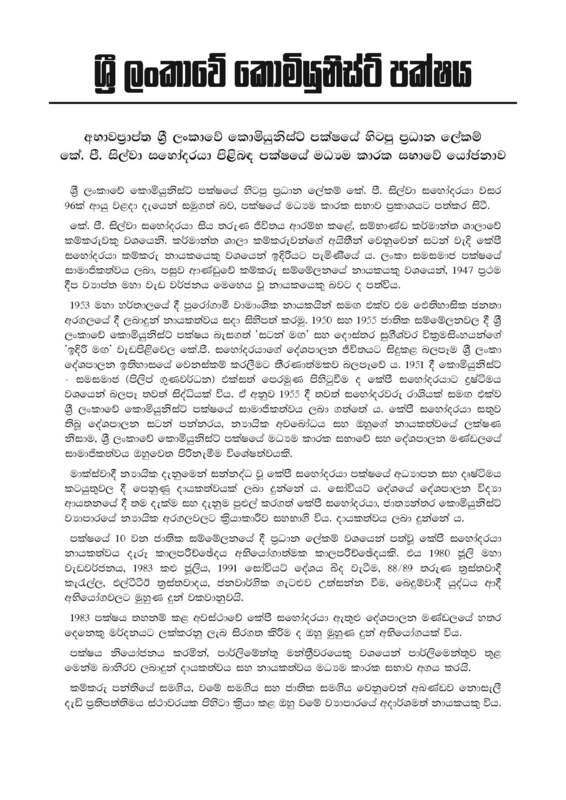 යන මැයින් මහාචාර්ය නවරත්න බන්ඩාර ශ්‍රී ලංකාවේ කොමියුනිස්ට් පක්ෂ මූලස්ථානයේ සුගීශ්වර ශාලාවේදී 2017/ 05/ 16 දින පවත්වන ලද දේශනය. 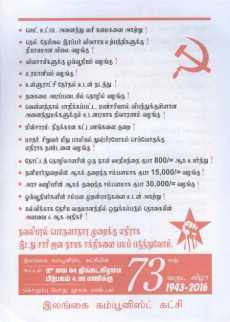 Communist May Day march from Ayurveda Junction to Viharamahadevi Park . 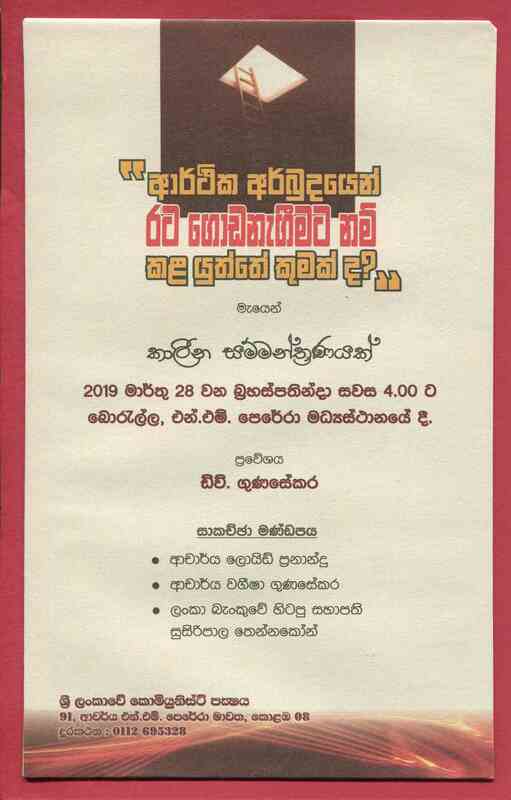 ශ්‍රී ලංකාවේ කොමියුනිස්ට් පක්ෂය ප්‍රමුඛ සමාජවාදී ජනතා පෙරමුණේ මැයි රැළිය නාරහේම්පිට ශාලිකා ශාලාව ඉදිරිපිටින් ප.ව 1 ට ආරම්භ වී කිරුළපන ලලිත් ඇතුලත්මුදලි ක්‍රීඩාංගනය දක්වා ගමන් ගන්නා ලදී. 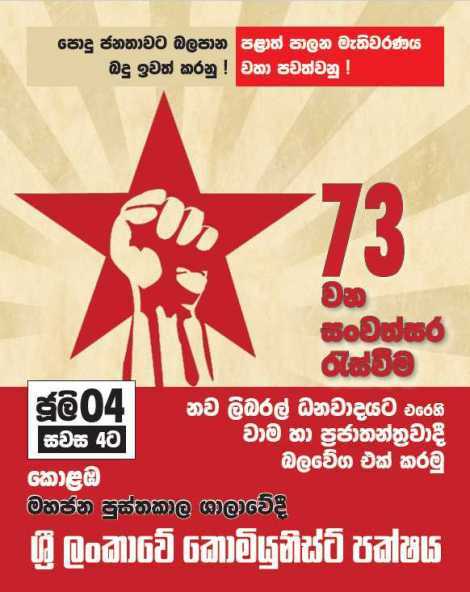 Joint May Rally of the Socialist People's Alliance started at 1.00 pm from Shalika Grounds Narahempita and ended from Lalith Athulathmudali Grounds Kirulapone. 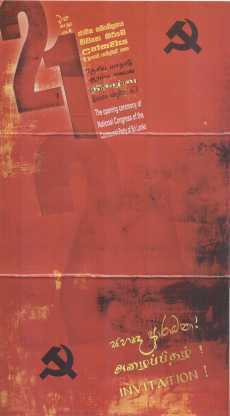 30th October to 01st November 2015 - Istanbul, Turkey. 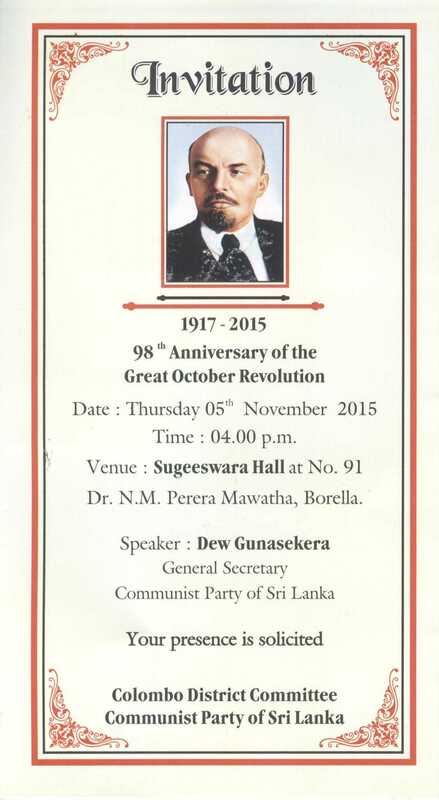 Celebration of 98th Anniversary Of the Great October Revolution - Speech Delivered by Comrade DEW Gunasekara on 05th November 2015. 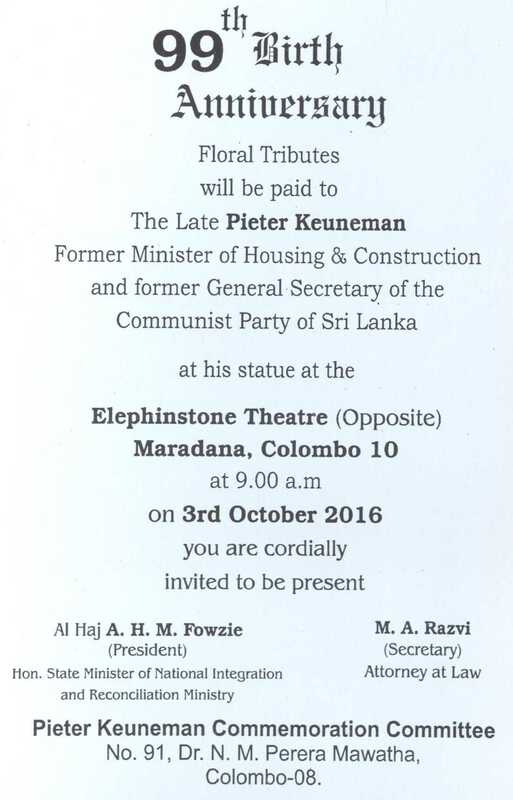 98th Birth Anniversary Floral Tributes will be paid to The Late Pieter Keuneman Former Minister of Housing & Construction and former General Secretary of the Communist Party of Sri Lanka at his statue at the Elephinstone Theatre (Opposite) Maradana, Colombo 10 at 9.00 a.m. on 3rd October 2015. 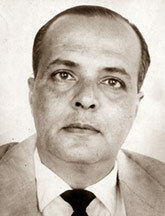 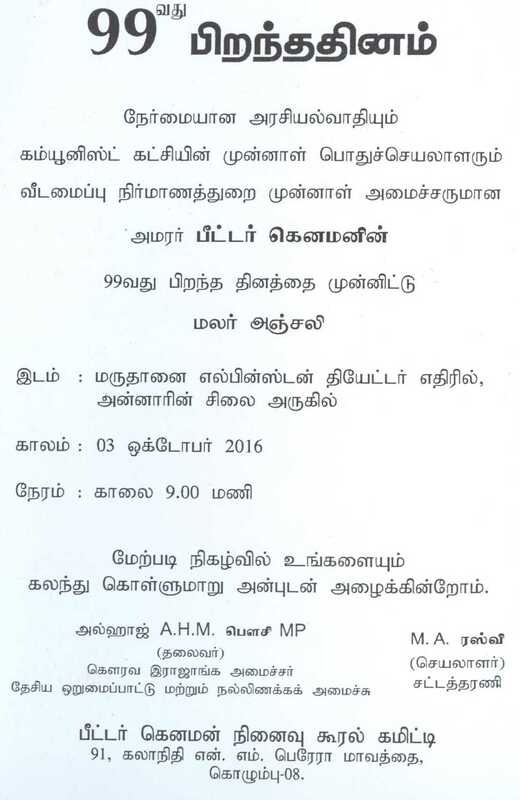 Pieter Keuneman Commemoration Committee - No.91, Dr. N. M. Perera Mawatha, Colombo-08. 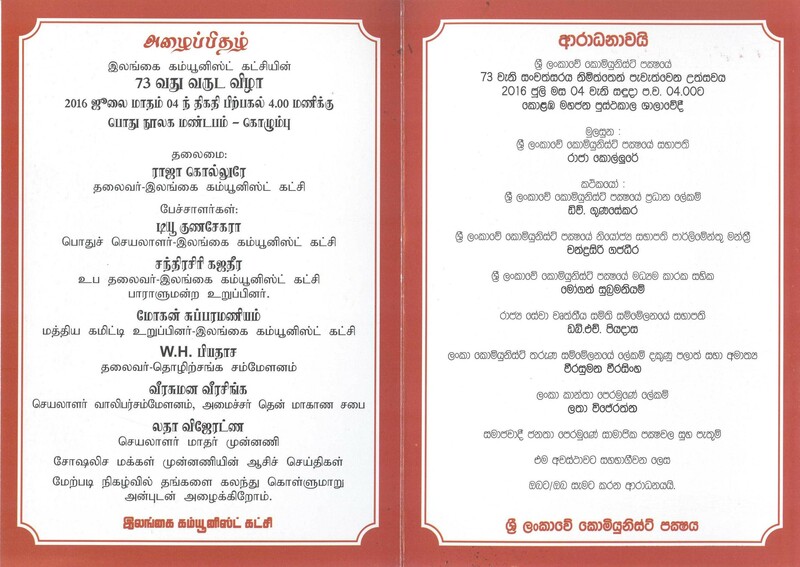 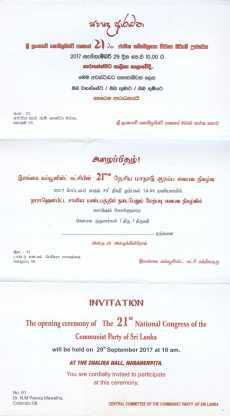 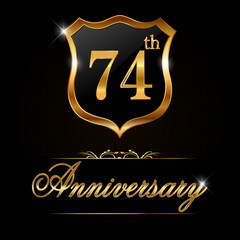 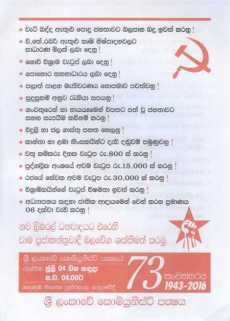 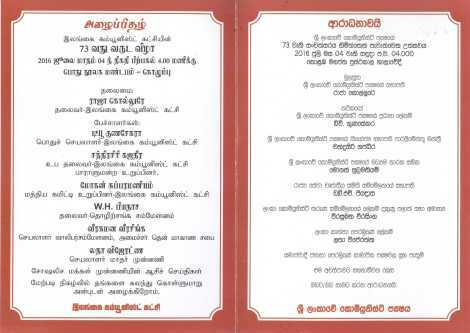 Journey of 70 Years - Communist Party of Sri Lanka. 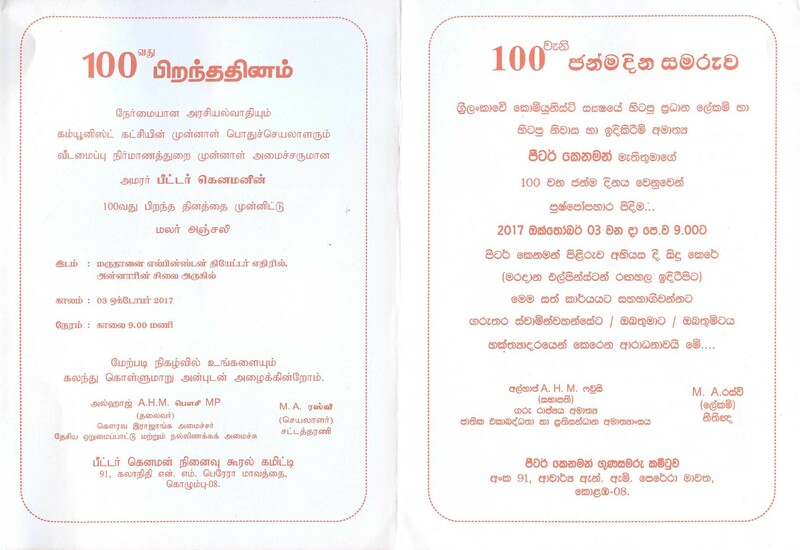 70th Anniversary will be held on July 03rd 2013 in Youth Centre Maharagama - Main Hall at 2.30 p.m.
Exhibition will be started at 12 noon.